Look at the faces of the audience and you see wonder. Yes, this is a spectacle, but one that in its simple storytelling, skilled manipulations of the lifelike puppets (the little girl seems steeped in watchful sadness; her dog gamboling through the streets, his tongue lolling) and playful changes of scale offers a theatrical experience that is both epic and intimate, joyful and sometimes sad. Follow it through, rather than just glimpsing it as a carnival-style parade, and you become as much invested in it as you do in King Lear, and as admiring of the craft and imagination employed to put it together. It’s certainly a marvel, but it is not just the extraordinary feats of engineering that hold the attention. These giants may dwarf us and even our great cities…….but it is human endeavour that animates them. Tiny figures in wine-coloured coats crawl across the bodies of the little girl and diver like Lilliputians. Each step of the diver takes gargantuan human efforts. The result is inclusive theatre where young and old rub shoulders with the giants. We walk together in their footsteps, and we walk taller because they are with us. The Sea Odyssey Giant Spectacular tapped into something very special in terms of public reception and makes extremely significant steps towards a successful future for large-scale street theatre….. The reactions that both Usher and Gardner speak about are evident here in this video. 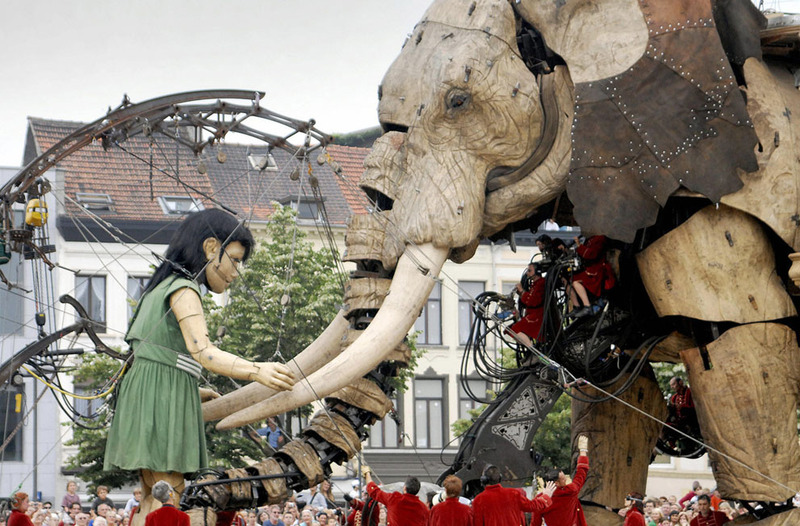 Royal de Luxe are truly a global company having performed in a diversity of countries – from Vietnam to Chile, Iceland to Australia – the list is long and impressive. Not all their performances include The Giants, but never the less they certainly have a global reach, as this set of images from The Atlantic shows. 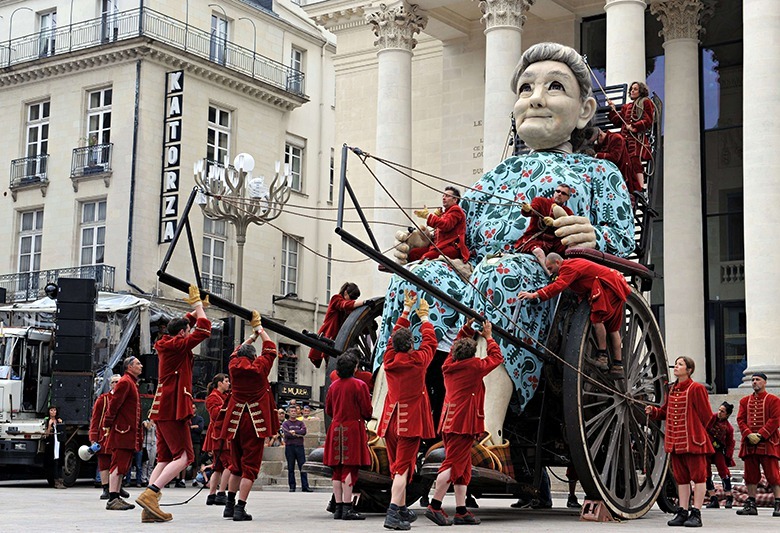 The latest performance for The Giants is happening this weekend, again in the city of Liverpool in the UK, which seems to have taken the company and their puppets to it’s heart. This time, as part of the commemorations of World War I. Growing up in the 1960s and spending so many years in the world of entertainment, I have seen and been part of some incredible things……I have been lucky enough to have had some experiences that I will remember for ever. But one of the things I will never forget came two years ago, when alongside tens of thousands of people from my hometown, I took to the streets to follow a 30ft wooden ‘giant’, her uncle and her dog around the streets of Liverpool. The city truly fell in love with those characters, and the French artists – Royal De Luxe – who brought them to life. On that occasion, the giants came to Liverpool to mark the centenary of the sinking of the Titanic – a seismic moment in history and certainly for the city, where so many of the crew from the ship were from. Some questioned if these giants were an appropriate way to commemorate such a disaster. They were proved spectacularly wrong. This week, Royal De Luxe return to the city, and this time to mark something even bigger in our history – the centenary of WW1.Liverpool was the birthplace of the Pals regiments – groups of friends who, with the words of Lord Derby and Kitchener ringing in their ears, signed up together to go on an adventure abroad from which so few of them ever returned. Over the course of the coming years, there will be hundreds of commemorations around that terrible war – some big national moments and some small intimate affairs – but for me, it is this performance – titled Memories of 1914 – which I know will be as powerful as anything which will follow it. Artistic endeavour such as this – big, bold and exciting – is a vital way for us to mark key historical events, no matter how sombre. They engage our senses and emotions in a way that other forms of commemoration would never be able to, and they break down barriers of age, class and race effortlessly. What is so compelling for me about Royal De Luxe is the way that they take the art to the people rather than wait for the people to come to them. Between them, the three giants who will be in the city this week – the little girl and her dog again, but this time joined by a brand new grandmother giant – will travel a total of 30 miles around the city, going down the streets of forgotten terraces, past the two incredible cathedrals which hug the Merseyside skyline, and into parks quite a way off of the beaten track. This spectacle will engage and impact more people in this story, than any normal form of commemoration ever could, getting people to invest in something they didn’t even know they should care about. Art can do this. It can touch us, thrill us, enrage us and engage us in things we might otherwise just let us pass by or choose to ignore. It makes us look and think differently about ourselves, where we live, our history and our future. I have been lucky enough to be at the centre of some of those moments myself, but this week I am looking forward to experiencing it again, like everyone else. Being one of the million people who are due to come together to commemorate, pay our respects and reflect on the ultimate sacrifice, by being brought together by a giant girl, her grandmother and a dog. Only art will ever be able to do that. What Johnston doesn’t mention is that the puppets are so large that the company employ local volunteers wherever they perform to be assistant puppeteers, otherwise known as Lilliputians. One such volunteer is Colin Bordley, who talks about his experiences here. An interesting little share today from Ideas Tap. As new technologies expand the possibilities of design in live theatre, whole new fields are opening up. In this interview by arts journalist Naima Khan with Kim Beveridge, digital artist, there is some interesting insight in to the role and the processes behind the art. Kim Beveridge has created video for productions at the Royal Court and the National Theatre of Scotland. Kim talks to Naima Khan about avoiding clichés. What challenges do video designers face when working on theatre shows? One common problem you face is being asked to work on a production that doesn’t necessarily have the budget to realise what the director and the company want to do. Ambitious projects are more and more common now as you can easily run video off a laptop. There’s not a lot of troubleshooting you can do if, say, your video’s not bright enough. You can’t give it more lumens [measurement unit for light] and you’ll have to communicate that to people you’re working with. Physical spacial challenges are also common when you put video into a space where actors need to be lit at the same time. You have to work closely with the lighting designer so you don’t bleach out what they’ve created. With the right budget you can get it right but it takes experience and experimentation. The work I make is very figurative so I like to start with something real and then manipulate it and edit it down to fit the show’s needs. One of the things I always ask is: what is the role that video is playing in this show? What is it here to do? In Pests, it was clear video was there to illustrate one character’s psychotic hallucinations. The other thing we had to nail were the elements that the playwright Vivienne Franzmann had written about in her script. She’d included fire (that was really pared down by the final edit), blood, which she wanted coming through the walls, and also the presence of men. So I wanted to find images that were actually frightening not Hammer House of Horror-funny because when you start to work with blood it’s easy to go down that road. We were keen that the images had a real textural quality because they were going to be projected onto mattresses. So I spent a lot of time filming ink and synthetic blood being bled onto fabrics like silk, and cotton. We put the camera underneath a stretched canvas of the material and just watched it move and bleed. How can video designers and theatremakers use video or projections in a way that is relevant while steering clear of clichés? When it comes to clichés, the fact that I’m working in collaboration means that it if I make a choice that’s obvious or boring, someone will tell me. But there’s nothing I wouldn’t try. It’s about experimenting. It’s about trying to make things lean, not having projection unnecessarily and only having it to support something that isn’t explicitly written in the text. I’d also recommend trying to be involved in the collaboration from the earliest stage. Don’t be precious about rough edits, bring them into the space early on so you can show what you’re doing and see if it works before you spend hours on the animation. Be open about what you intend on doing, trust that the people you work with will have good imaginations and they’ll be able to use your rough sketch to come to an agreement about how to move forward. How did you get your first job in theatre? I studied Time Based Art at Duncan of Jordanstone College of Art so my background is doing video installation, sound and documentary. But I was always aware of spaces and I like projecting work in unconventional spaces. It was around 2005 that I left art school and the National Theatre of Scotland (NTS) started soon after. I was headhunted by them and hired to work on documenting the process in rehearsal rooms. What I learned was, if you do video and sound, your skills are really transferable and you don’t have to work in theatre design. Pretty much immediately I started meeting loads of people who make shows and started working with them. It wasn’t long after that that Vicky Featherstone asked me to work on a large-scale production called Wall of Death, which was a documentary installation projected onto eight screens. Getting into theatre can happen quite quickly, it’s a lot about recommendations. I don’t have any business cards but if you get your name out there, things can start to happen. How should video designers prepare themselves for work in the theatre industry? There’s a book you should read called Staging the Screen: The Use of Film and Video in Theatre by Greg Giesekam. You’ll learn about the history of it and it’s surprising actually how long people have been doing this. If you really want to get into video design, just start experimenting. Find your strengths and see how they work with something live. Document people or performers interacting with your videos. Find a peer group that includes actors, maybe cabaret artists or even live musicians. You could also go straight to people who are already working in theatre and ask them about work experience or courses. For example, there’s a great company called 59productions, which did some amazing stuff for the London Olympics, and one called Forkbeard Fantasy who do really cool experimental stuff, they also incorporate puppetry and animation. I don’t think you should worry about the industry too much. If you’ve got talent, and the guts to contact these people, they’ll help you through it. If they can, they probably will give you their time. I find myself in Sabah, Malaysian Borneo this week and as coincidences go this is a good one. On the way here I came across an article in The Wall Street Journal about shadow puppet theatre – but with a difference. Entitled Star Wars as Shadow Play, the writer John Krich talks about a new shadow play called Peperangan Bintang, which translates from the Malay into Star Wars. A 25-minute preview of “Peperangan Bintang” (Malay for “Star Wars”) premiered last October. Drawing on the first of the films to be released—whose full title is “Star Wars Episode IV: A New Hope”—it features Sangkala Vedeh (Powerful General Vedeh, or Darth Vader), Perantau Langit (He Who Walks in the Sky, or Luke Skywalker) and Puteri Leia (Princess Leia), plus the familiar squeaking robots, augmented by banging gongs and screeching horns, eerie graphics, dramatic recitations and sound effects of heavy breathing and robotic squeaks. Mr. Chuo is still working on turning it into a full-length shadow play, usually 1½ hours. “I thought it was a brilliant idea from the start,” says the retiring president of the Star Wars Malaysia Fan Club, Adi Azhar Abdul Majid. The club of 200 paying members—”from architects to kids who flip burgers,” says Mr. Adi, a former lawyer and freelance professional emcee—stages movie marathons and garage sales of memorabilia to support local charities. With the fan club’s help, Mr. Chuo was able to contact Mr. Lucas’s Lucasfilm, which said through a spokeswoman that Mr. Chuo’s “art was beautiful” and “was impressed with his passion for ‘Star Wars.’ ” Lucasfilm said it has offered to put Mr. Chuo’s photos in its fan publication, Bantha Tracks. The master soon helped Mr. Chuo fashion 10 puppets the old-fashioned way, of cowhide, the holes made by nails. Pak Dain’s only hesitation was over his reputation for authenticity. He decided it was acceptable to adapt “Star Wars” because tradition allows “outside stories” to augment main mythic plot outlines. “Nobody has complained so far,” Pak Dain explains, because musical themes specific to the Hindu characters Rama and Sita were changed. “I told him that if some found us inauthentic, I would take the blame as the Chinese guy,” Mr. Chuo says. Hailing from the Tumpat district of Malaysia’s northern state of Kelantan, a shadow-play hotbed, Pak Dain was taught by three learned masters and began mounting performances in the 1980s. He retired in 2008, but kept a connection, pouring his money into training musicians to keep alive this art that was once a regular feature of weddings and village celebrations. Unable to perform, he opened a Kota Bharu gallery for the puppets. It is estimated there are only 10 surviving master puppeteers around Kelantan, where the form of theater was adapted from Indian sources. Compared with the better-known Indonesia version, Malaysian wayang kulit features rounder, more transparent figures—colors shine through the silhouettes. The characters have one movable arm, as compared with two in Indonesia. The fact that traditional techniques of puppet making and puppeteering are the centre of this effort is heartening, as is the use of traditional Malay instruments to play the soundtrack. Also, there is an alignment of characters with those in the traditional Wayang Kulit stories, which will hopefully widen the appeal. On the flip side, when the New Straits Times wrote about the venture, they did so on their ‘Tech’ pages, because of the computer generated visual effects being used. This truly is fusion in so many ways. It has been a few months since I have written about the discussions and debate surrounding the streaming of theatre, live and recorded, to cinemas, performance venues and across the web. In my last two posts on the matter, Something to Stream About and Something Else To Stream About I wrote about the experiences, arguments and concerns as they were being put forward. In the UK in the past few weeks the discussion has gathered pace again, with further written comment, the publication of a piece of research with regard to its impact on audience figures and continued experimentation with the form. But while I remain an evangelist for live theatre, I think it’s time we stopped pretending that it offers an unreproducible event. A theatre performance can now be disseminated worldwide with astonishing fidelity. This represents…….a revolution which knocks on the head the old argument that theatre is an elitist medium aimed at the privileged few. 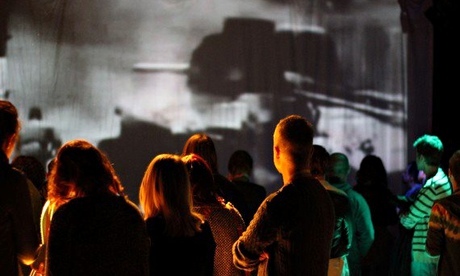 Interactive theatre-makers…. [who] weave together theatre and game design to create dynamic shows and experiences that can take place anywhere that people gather: in theatres, schools, museums, on the streets and online. The live premise is simple: you arrive at the “secret location”, take part in a bit of audience participation and then meet Gavin, a man who has been granted the power to draw pictures of future events (a plot wittingly or unwittingly lifted from the wonky US science fiction TV show Heroes). The online premise is more complex: Coney’s stated aim is to experiment with how they might be able to let people interact with the performance even if they are not physically present. To this end, online viewers could choose which camera they watched from, interact in the site’s own chat facility and even control spotlights in the room itself. Now this is clearly a different beast to streaming theatre as it has been developing so far, but indicates the pace at which interactive technologies have the potential to shape the future development of theatre. Arts journalist Miriam Gillinson also wrote about her online experience watching Better Than Life, as opposed to Haydon’s ‘real-life’ viewing, in her blog post, ‘Better Than Life’ review or ‘Is there a triple click option?’. However, both seem to agree that whilst it was a form still very much in development, there was distinct and intriguing potential in the work and how it might point to the we ‘watch’ theatre in the future. To explore Coney’s work more, there is an excellent interview by Rohan Gunatillake with the company’s co-director, Annette Mees, for Native Magazine intriguingly titled Gorillas, beautiful tension & Better Than Life. In the interview, amongst other things, she explores the difference between their work and the more conventional broadcast streaming of theatre. As I said at the beginning of the post, one of the things that prompted me to revisit the streaming discussions was the publication of a survey in the UK that seems to show that the advent and growing audiences of streamed theatre is not, as some feared, having a negative effect on live audience attendance either in the capital or in the regions, as some feared. The survey was carried out by Nesta (a charity that funds innovation in the arts sciences and technology in the UK) and you can read their findings here. There is a condensed version of the findings here, courtesy of Whats On Stage. Now obviously, these statistics are for the UK and they left me wondering how they would extrapolate out for international audiences of streamed and broadcast theatre. Since I last wrote about this subject and lamented the lack of broadcasts to Hong Kong, the National in the UK have at last found a cinema partner here. Their initial foray – Frankenstein – was an immediate sellout (I was too slow) and since then, more and more broadcasts have been added with Coriolanus and The Audience begin shown multiple times in the next couple of months. They are immensely popular with Hong Kong audiences (I don’t mean just expats either) and I can see how they are creating an audience-in-waiting of theatre goers ready for their next trip to London. I could be cynical of course and comment that all of these productions have star actors with international reputations and are therefore an immediate box office draw. However, I won’t and I can’t – I am just delighted that I can now see what I consider to be some of best theatre in the world in the place I choose to call home. I also want to a mention of another streamed event, that in a week that saw 500,000 people take to the streets of Hong Kong demanding universal suffrage, has significant resonance for me. On June 24th, The National Theatre of Scotland hosted The Great Yes, No, Don’t Know 5 Minute Theatre Show which streamed for 24 hours, pieces of theatre lasting no longer than 5 minutes to and from around the globe. Driven by the upcoming vote on Scottish independence from the UK, the idea was to create a democratic, dramatic response to the theme of ‘Independence’ – identity, borders, language, and national identity. You can watch some of the contributions again here. Quite rightly, many of them are from Scots making their own comment on what is to come on the 18th September, but there are also contributions from around the world. Theatre and democracy, hand in hand. So as the experiments continue and the debates rumble on, I leave you with an article, Three Nationals, again from Native Magazine, this time by David Kettle, in which he talks to leaders in the three national theatres of the UK – The National, The National Theatre of Scotland and The National Theatre of Wales – about their digital visions. It leaves me in no doubt digital theatre broadcasting and streaming is hear to stay. Last week I had a moment of enlightenment while doing some reading around site specific theatre. Actually it was more of Homer Simpson ‘duh’ moment. We tend to view site specific/responsive theatre as something new, simply because of its huge and growing popularity. This was my Homer moment, the realisation that of course it has been around in one form or another for hundreds of years, both in the East and the West. One site specific performance that is almost 200 years old is the Ramlila of Ramnagar performed in Varanasi, India every year. It was started in 1830 by the Maharaja Udit Narayan Singh and is a theatrical portrayal of the Hindu epic, the Ramayana. Ramlila or Ram Leela (which means, literally, Rama’s story) take place all over India, but the one in Ramnagar is an epic in its own right. It lasts 31 days and takes place over an area of almost 8 square kilometres – basically the city is turned into an open-air set. It is steeped in tradition – characters are played by local actors and major roles are often inherited by families, a good example being, the role of Ravana which was held by same family from 1835 to 1990. It is reckoned that over 1 million people come to watch the spectacle every year. What interested and heartened me was that the ‘audience’ are indeed pilgrims. Very few foreign visitors are amongst the spectators as Ramnagar currently has no real tourist infrastructure. It wasn’t until 2013 that it was officially allowed to be documented on film. There are two excellent articles which are worth reading if you’d like to know more. The first is by Richard Schechner, a professor of performance studies at New York University. 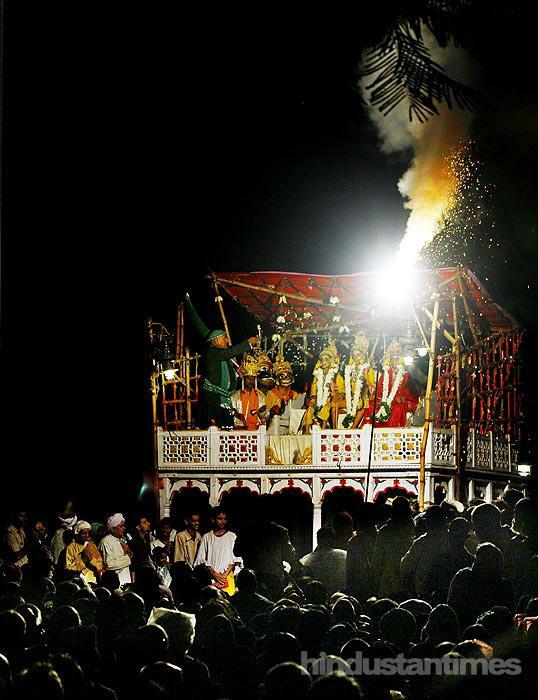 Written for the The New York Times, A Maharajah´s Festival for Body and Soul is an excellent insight to the Ramlila of Ramnagar and details the potential problems that face it in the 21st Century. The other, equally as informative, is by Saudamini Jain for the Hindustan Times, entitled A look at the grandest Ramlila in the world. Another interesting online source comes from ZeeNews and is about the Dussehra Festival during which the Ramlila takes place. In his Introduction to Theatre in India, David Mason, Associate Professor of Theatre, Rhodes College draws the parallels between the Ramlila and the liturgical dramas and passion plays of Medieval Europe. This ties in with my opening paragraph to this post, as one of the traditions I realised was effectively site-specific is the Oberammergau Passion Play which is performed every 10 years by the inhabitants of the village of Oberammergau, Germany and been done so since 1634. One more excellent resource that I have come across is The Ram Lila by Norvin Hein. Very detailed and clearly part of a larger work, although I cannot attribute it beyond that. So there you have it – my ‘duh’ moment has left me a wiser person.